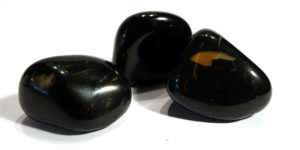 Black onyx protects and grounds, calms basic fears to allow a feeling of safety and security, and roots spiritual energy in the body for work on the physical level. It is considered to bestow strength, especially in times of stress, and on a physical level can be beneficial for the eyes, bone marrow, and motor nervous system. It should be worn for long periods of time, as the benefits can take some time to manifest.